A delightfully delectable yet complete and balanced meal that is rich in Omega-3, Omega-6, antioxidants and taurine. Country Delight is also loaded with essential vitamins ideal for healthy teeth and bone development; as well as beneficial prebiotics to support digestion. 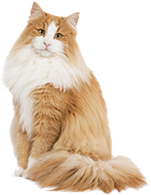 The recipe is specially developed to provide hairball control with the inclusion of natural fibre in the formula. Aatas Cat Delight series is manufactured only in well-reputed establishments which are committed to the highest standards of food safety and strictly adhere to International Manufacturing Practice Standards. 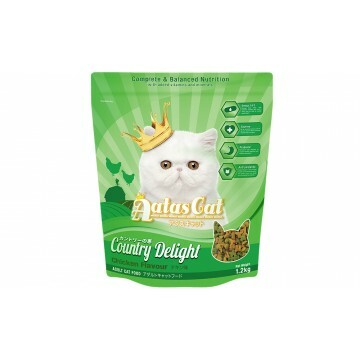 Aatas Cat Delight series is a complete and balanced food for adult cats. Feed alongside Aatas Cat complementary wet food, for a flavoursome and healthy diet of high protein and moisture content with moderate fat levels. Soy bean meal, Corn, Wheat bran, Corn gluten meal, Poultry meal, Tapioca, Poultry fat, Tallow, Digested animal protein, Dicalcium phosphate, Salt, Vitamins (Vitamin A, Vitamin D, Vitamin E, Vitamin K, Vitamin B1, Vitamin B2, Vitamin B6, Vitamin B12, Niacin, Pantothenic acid, Folic acid, Biotin), Minerals (Copper, Iron, Manganese, Zinc, Iodine, Selenium), Tuna extract, Coloring agent (White, Green, Orange), Choline chloride, Fish meal, Salmon oil, Palm stearine, Mannan oligosaccharide, Taurine, Preservative agent (Propionic acid, Vitamin C, Vitamin E).